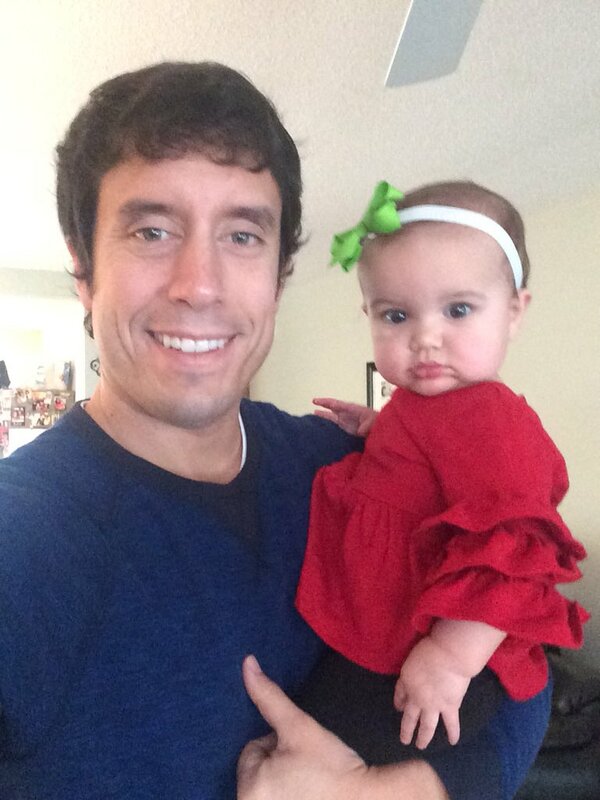 This special end of the year blog post is dedicated to my daughter, Sloan. With her arrival this year, she changed by life dramatically for the better. As I sit here reflecting on the year, I can’t but help feel accomplished. What did I manage to do after having back-to-back-to-back banner years from 2014-2016, each one besting the one before it? Well, I went out and had a 2017 that trumped them all. Oh Brent, don’t get cocky. Even though 2017 was perhaps the best year of all, you had little to do with it. I can always depend on my internal conscience to bring me back down to earth while imparting truthful wisdom. What can I say? The voice inside of me is right. As long as I live, 2017 will be an extremely special year for me. I will use it in passwords, I will make a Christmas tree ornament out of it, and if I ever decide to get a tattoo I will have those four digits inked close to my heart. When you have your first born, especially when it is a sweet and beautiful little girl, it can turn the worst year into the best year. Even though the first quarter of 2017 was going just fine for me, when Sloan was born on St. Patrick’s Day, it elevated the year into my personal history books. And yes, as I was reminded above, I had little to do with the blessing of Sloan (at least the hard stuff, anyway). Sidney labored long and hard while Sloan fought tough to make her appearance in the world. When the operating team placed Sloan in my arms, I had to ask what did I do to deserve her? Other blessings of the baby variety came in 2017 as well. My sister-in-law had her third child, Henry, on June 1. My sister had her first son, Johnny, exactly four months after Sloan was born on July 17. It was exhilarating to watch our extended family grow! Speaking of blessings, I saw my parents more times over the course of the year than any of the previous years I spent in Myrtle Beach (having a grandchild will do that). My dad surprised me in Nashville at an awards banquet. 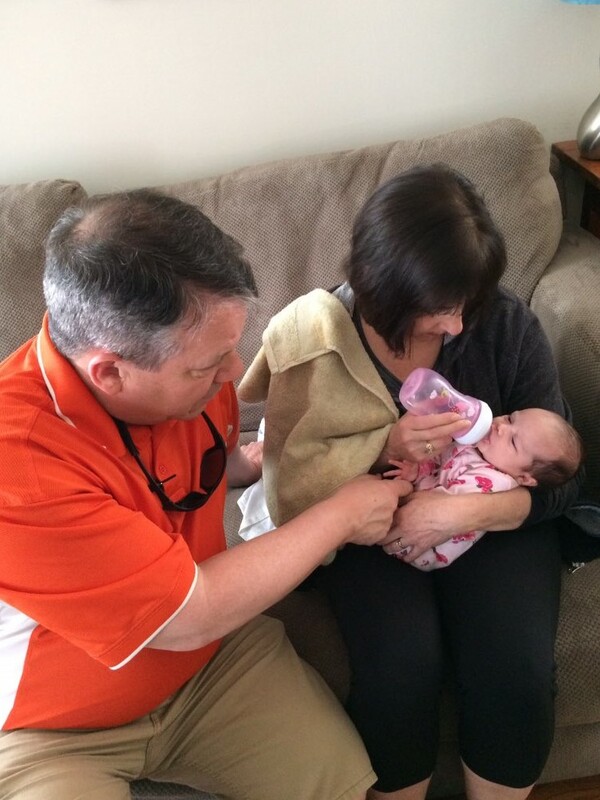 Both parents visited Myrtle Beach shortly after Sloan was born, providing more support than I could ever dream of. Mom and dad also made individual trips out east as well. My little family went to Spokane twice, once in the summer and then again for the holidays. We vacationed with Sidney’s family in Hilton Head. It was nice to spend time in such a beautiful, laid back environment considering we had all spent so much time together in hospitals over the year. Two births and some other health issues had made us regular occupants at Conway Medical Center. But the challenges grew us closer together and at the end of the year everyone is healthy. Our faith has strengthened over the year. Observing the miracle of birth will remind you that God is amazing. We had a great 2017 at St. Andrew Parish. We said goodbye to our pastor and parochial vicar but welcomed equally excellent clerical members when Father Roger Morgan and Father Jose Quilcate arrived at our parish just prior to the Lenten season. Sloan was baptized inside the walls of St. Andrew in a beautiful ceremony as our roots as parishioners at the sole Catholic church in Myrtle Beach grew even more entrenched. It was a year to remember at work. Our social media team won several national awards from various organizations. Our program was also analytically declared one of the best in the country as both our Twitter and Facebook accounts earned spots in the top 10 among all division I schools for engagement. 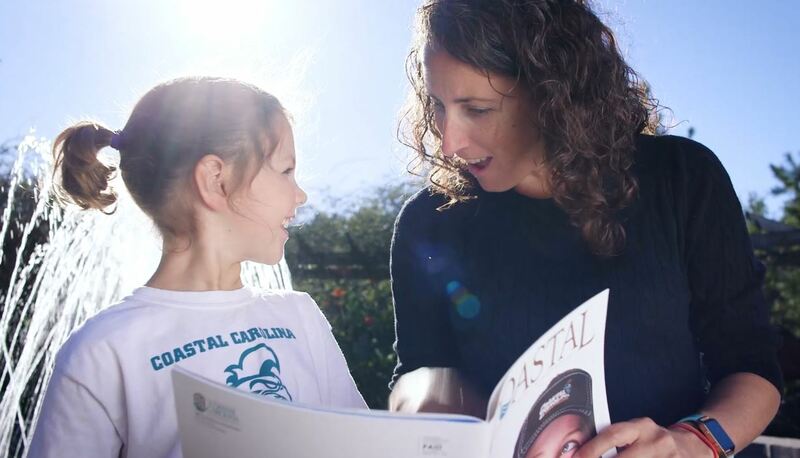 Outside of my social media duties, I had the honor of writing the cover story for our fall/winter edition of Coastal Magazine. I continued to work with some excellent individuals within our University Communication department and I watched my two hardworking interns graduate. As 2018 beckons, I am looking at a year that has no predetermined life changing events (i.e. wedding, birth of a child) that will define it. That is okay. It just means that I will have to make some of my own along the way. If a couple goals I have set don’t come to fruition it won’t be a major bummer, I know my family could use a low key and relaxing year. But back to 2017 for just a final minute. This year was incredible, and I am thankful to everyone who played a part in it. It was one for the ages and I feel so fortunate to have lived through 12 special and life changing months. Thank you, God, for the gift of Sloan. Don’t Blink. Who is ready for what I affectionately refer to as my Big Blog Post? At the end of each December, I look back on all the blog posts I wrote during the year and select my 10 favorites. As an active blogger, this is never an easy task. Over the past 12 months, I have published over 200 posts, requiring me to evaluate a lot of writing to identify the 5% of my work I liked the best. Well, it isn’t all about the work “I like best.” When compiling this list, I consider how each post was received by you, my readers. So, using a mix of what I deem my best and most creative work combined with the posts that garnered the most views and social media reaction, I pieced together this year’s list. Thanks for your readership. Believe me, if it wasn’t for you, I would not have written 206 times this year. Now sit back, relax, and enjoy a look back at the best of Don’t Blink in 2017. 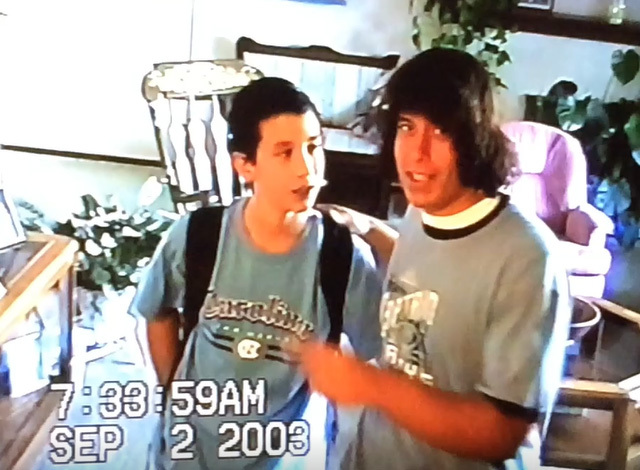 My brother and I in 2003 right before we executed our handshake. 9. 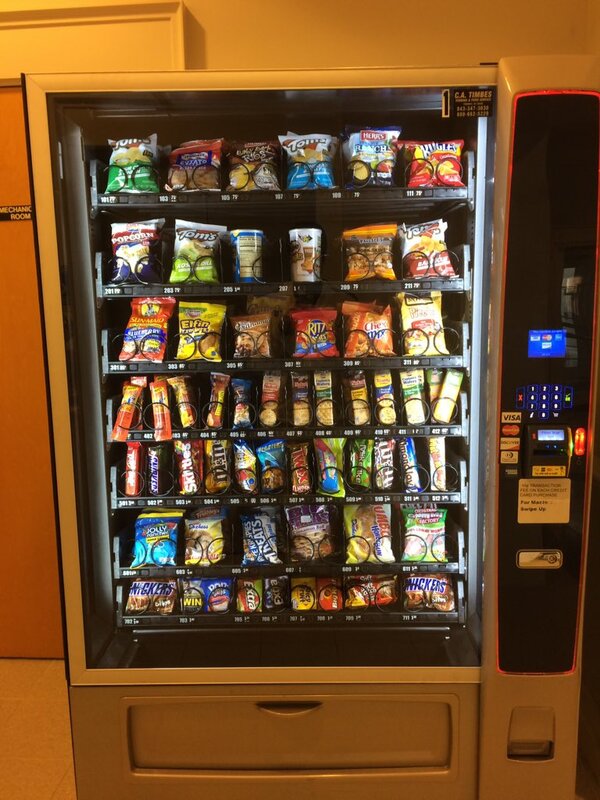 My Vending Machine Draft (November 20) – I look back on this particular post as one of my more original (or perhaps desperate) blog posts of the year. I took a photo of a vending machine on the campus of Coastal Carolina and then later that night I proceeded to “draft” all 51 items inside of it. I chose Lance’s Peanuts with my #1 pick and I selected Hannah’s Red Hot Sausage dead last at #51. If you want to see where the other 49 items fit in, you will have to read the post. File this one under “you have too much time on your hands” but I had a fun time doing it. 8. Two Special Students (December 15) – Remember this one? You just have to go back a little earlier this month to when I originally published it. In the post, I honored my two student interns who gave so much of their time and talent to our social media program at Coastal Carolina University. Eddie Harris and Monica Trepiccione left a positive impact on both #CCUSocialMedia and myself. I described how they not only excelled at their jobs but how they always managed to brighten my day. It was a pleasure to watch them graduate just a couple weeks ago. I was very lucky to have Eddie and Monica serve as my social media interns. 7. 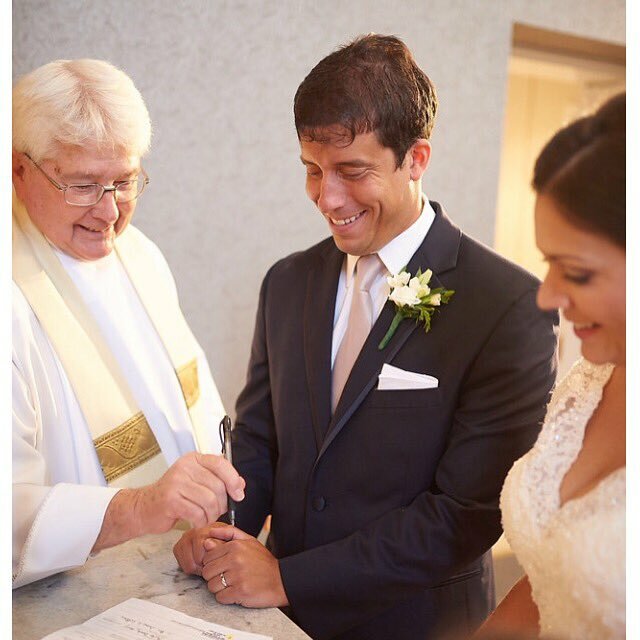 A Man of Faith: Monsignor James LeBlanc (February 26) – I love writing profile pieces and this one was particularly special for me. During the early part of the year, the Bishop of Charleston gave our pastor at St. Andrew Parish in Myrtle Beach, Msgr. LeBlanc, a new assignment in a different town. Upon his departure, I wrote this blog post thanking him. He was the spiritual advisor for Sidney and I. He married us and even included us in one of his homilies. Although not your typical Catholic priest, he is extremely good at his job. This post made the countdown because of the impact he had on us and because it was just such a colorful profile to write. 6. 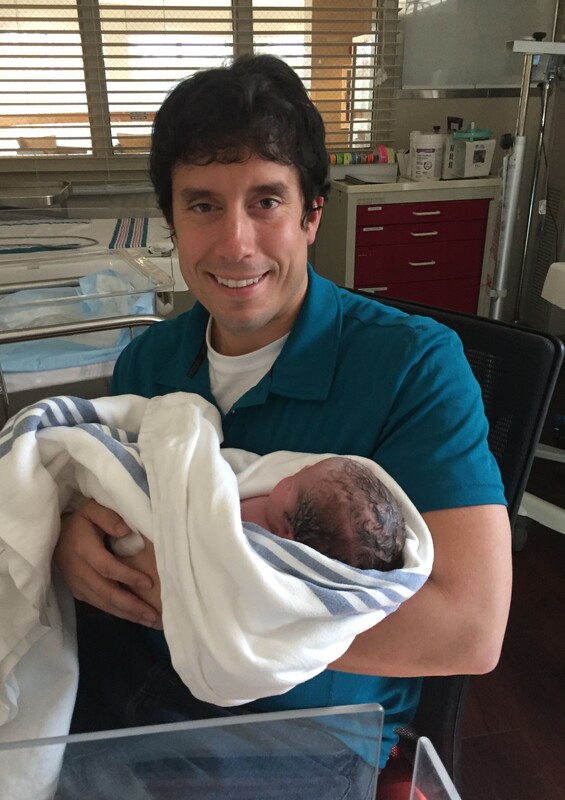 An Endorsement From Mom and Dad (April 26) – When you are a new parent, you can feel some uneasiness. Am I doing it right? Am I giving my baby the love she needs? Am I giving it 100%? In the first couple months of having Sloan, I asked myself these questions a lot. Although I received a lot of support from those around us, nothing meant more than getting a ringing endorsement from an important duo…my parents. When my mom and dad visited Sloan for the first time in April, they communicated to me, both face-to-face and with a beautiful letter, that Sidney and I are great parents. It meant so much. Because of how comforting their support was, this blog post easily cracked the countdown. My parents gave Sidney and I some very comforting encouragement. 5. 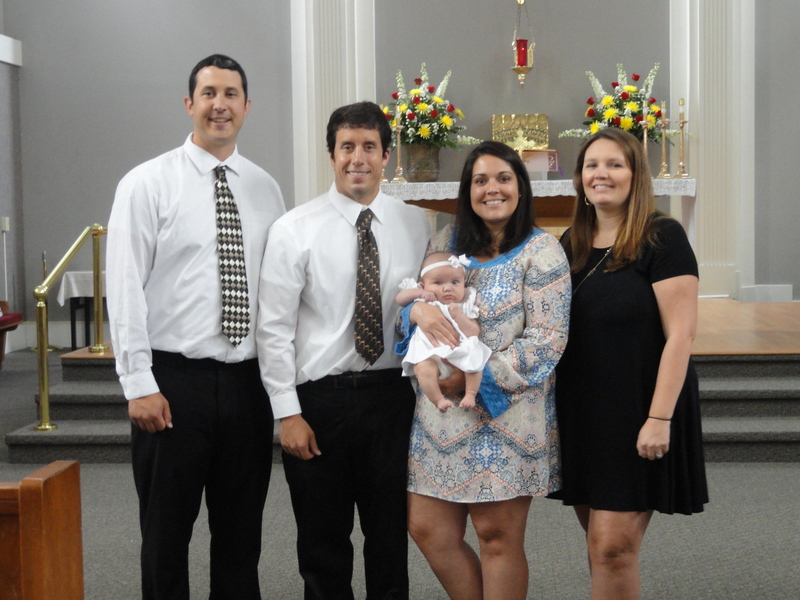 Sloan’s Baptism (July 2) – The best day of Sloan’s short life came on June 25 when she was baptized at St. Andrew Parish. As she was cleansed of sin and welcomed into the church, family and friends gathered around to witness the holy moment. It was a significant day I will never forget. In this blog post, I recount the entire beautiful ceremony from Deacon Jones’ opening address to the touching display of everyone coming up and tracing the Sign of the Cross on Sloan’s forehead to the moment when the water actually flowed. This is a record that I am proud of and one that I will have Sloan read when she gets older. Welcoming Sloan to the Catholic Church was very special. 4. 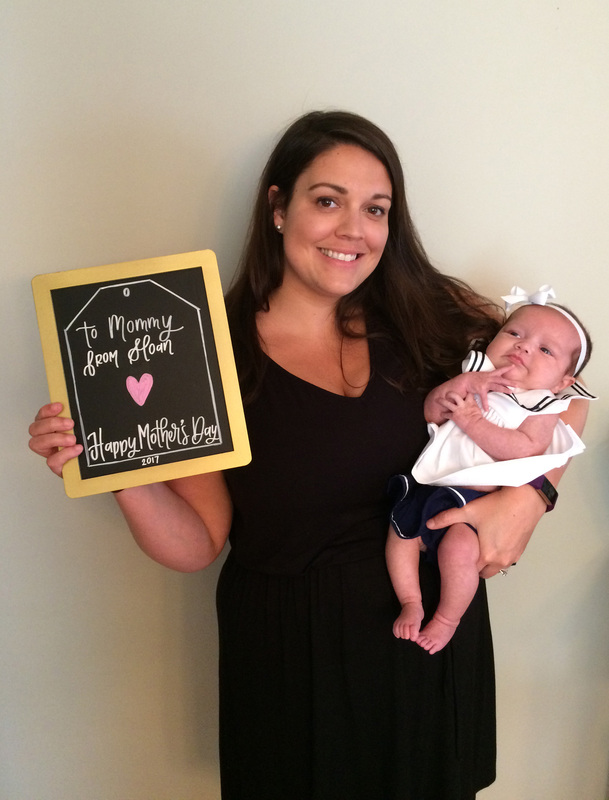 I Am Proud of Sloan Because (June 6) – Some people, and understandably so, can’t figure out how anyone could be “proud” of a baby, let alone a little girl who had not even turned 3 months old yet. In this blog post, I tried to shed some light on why parents are prideful of their infants. Although many of the 10 reasons I gave were meant to be humorous, a few were God-given truths on why Sloan fills my heart with pride. It wasn’t necessarily a blogger behind this post; rather, it was a proud daddy, and because of that it is one of my favorites of 2017. I have so many reasons to be proud of Sloan. 3. 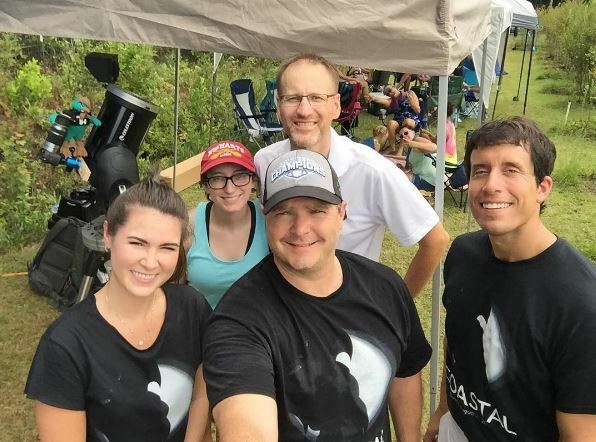 Observing Totality and So Much More (August 22) – It was another great year at Coastal Carolina University with a lot of achievements, but my favorite work moment came during the Great American Eclipse. Ironically enough, I wasn’t even on campus when it happened. I was in a remote South Carolina town called McClellanville, an area in the nation that was in line for complete totality. Although the weather almost prevented us from seeing the spectacle, the stars aligned at the last minute (pun intended) and we saw the eclipse in all its glory. However, it wasn’t just the heavenly phenomenon that made the day so special, it was who I spent it with. In this blog post, I described that seeing the eclipse was just half the fun. In a countdown saturated with family-related posts, this one stands right with them. 2. Happy First Mother’s Day, Sidney (May 14) – Before Sloan was born, there was never a doubt in my mind that Sidney would be an amazing mom. Little did I know that she would still manage to exceed all my expectations. 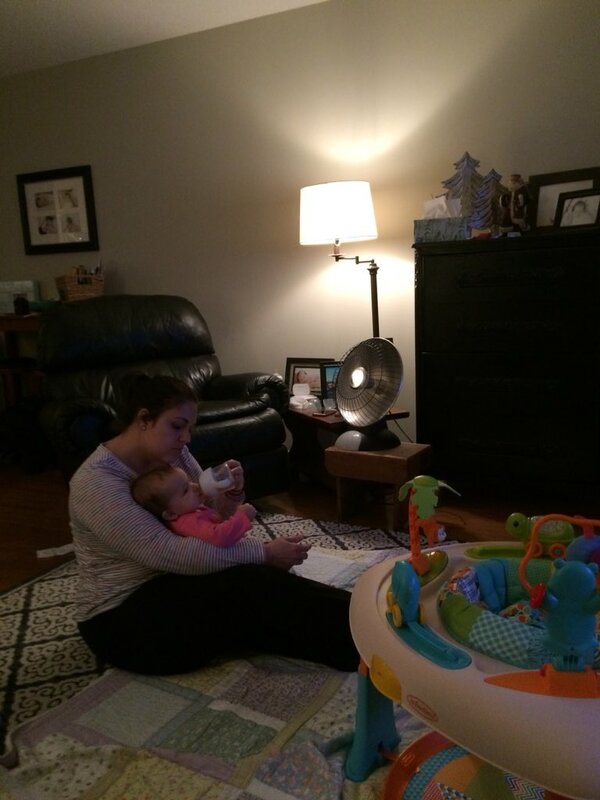 This past Mother’s Day, I wrote about the qualities possessed by Sidney that make her the best mommy you will find. In the post I described her as a “mom beyond her years” and I think that about sums it up. If you read this post I think my admiration and love for Sidney is clearly evident, making it not just one of my favorites of the year but also one of my favorites in the history of Don’t Blink. This was Sid on Mother’s Day. It was a pleasure to dedicate a blog post to her. 1. Long, Painful Process; Beautiful, Perfect Result (March 21) – Well, what can I say? This particular blog post happens to be both my personal favorite and the most viewed of 2017. Delivering Sloan was not easy. We went through a week-long saga to meet her once Sid was admitted into the hospital. However, the drawn-out process was 100% worth it. In this post, I take you through the curvy road that started with Sid hooked up to a machine and me almost passing out to us walking out of the hospital on a sunny morning with our beautiful baby girl. This post focuses on the strength of Sidney, the gift of Sloan, and the point in time that our lives changed for the better, making it easily my favorite blog post of 2017. No surprise that the blog post marking Sloan’s birth tops the list of 2017. I write a lot of duds, but every now and then I publish something with a little bit of substance. The above showcases some of my better work from 2017. Thank you for sticking with me this past year, it has been a fun ride. As we welcome 2018, my goal will be to write each blog post as if I was going to include it on my end-of-year top 10 countdown. Don’t Blink. Merry Christmas! It is with a full heart that I wish you and your family a glorious and significant day. This year’s holiday is especially meaningful for our little family as we celebrate Sloan’s first Christmas. To say the least, it is a joyful morning in the Reser household. Make sure to take plenty of time today to reflect on the true meaning of this holiday. For God so loved the world that he sent his only son to be with us. And while he was sent to be the Prince of Peace, he was not given an entrance into the world that many of us would deem fit for royalty. 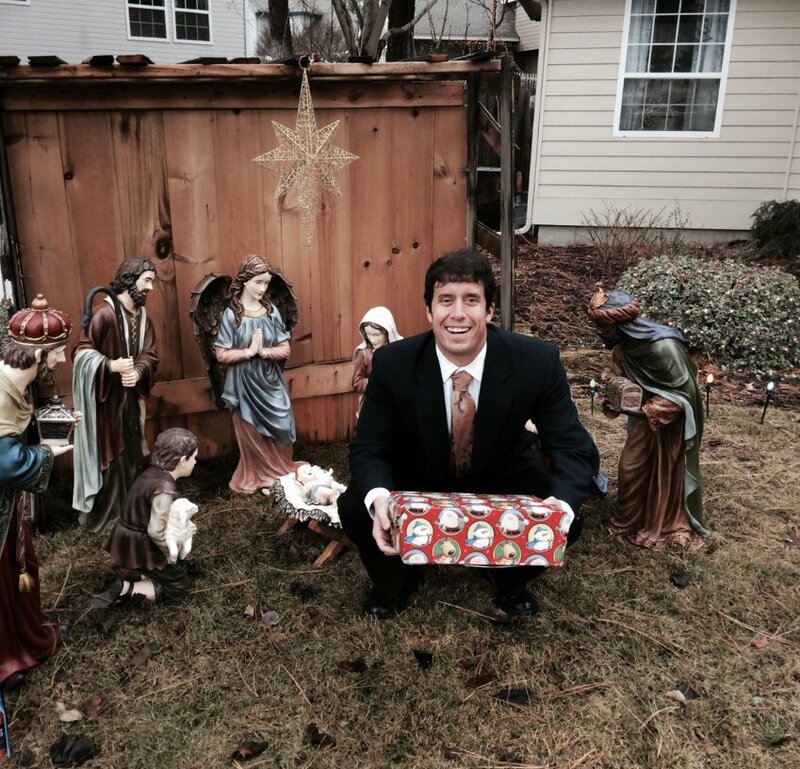 Instead, Jesus had humble beginnings, his mom giving birth to him in a manger. Take time to reflect on the true meaning of Christmas today. As we celebrate Christmas today, let’s remember the humble roots of Jesus Christ. This time of year, it is easy to get caught up in everything from presents to good food to Santa Claus. While all of this is fine, we should be mindful not to let it overcome our holiday. Rather, we should practice humility as we accept that God gave us an extraordinary gift that we truly didn’t deserve. I will have plenty of time to reflect on this later today as I fly across the country. Sidney, Sloan, and I will be departing for Spokane this afternoon. We are overjoyed to spend a portion of our holiday season with our west coast family. As is usually the case, it will be a long trek. We will drive to Charleston to take a non-stop flight to Seattle. We will then hop on a plane that will take us the short distance to Spokane. Sloan was perfect when she completed this journey over five months ago, but there is a big difference between a 4-month-old and a 9-month-old. We hope she does okay. Once again, Merry Christmas! Have a fulfilling day. Next time I write to you guys I will be in a winter wonderland. Don’t Blink. It is the Thursday Rundown before CHRISTMAS! Who out there is excited?! This blogger certainly is. Well, I better get started so I can go back to eating Christmas cookies. How Do You Cut Your Toast? – If you are asking me, the answer is I don’t cut my toast. Honestly. I only use a knife to spread peanut butter on it. I pick up the piece of toast completely intact and eat it. But I am in the minority. 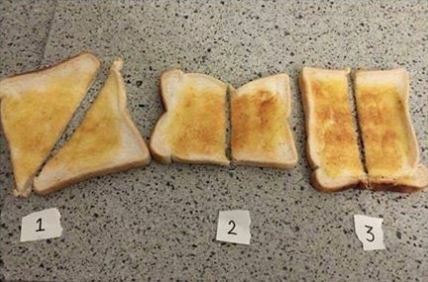 Social media has caused millions of people to speak out on the right way to cut toast. At restaurants I have ate it all three of the ways depicted and not once did the way it was cut change the taste. People are pretty passionate about how they cut their toast. How about you? 1, 2, or 3? Filling Up a Journal – The next Thursday Rundown I write, I will be using a new journal. For those who follow Don’t Blink closely, you know I am an avid journaler, having chronicled every day of my life for the past 16 years or so. 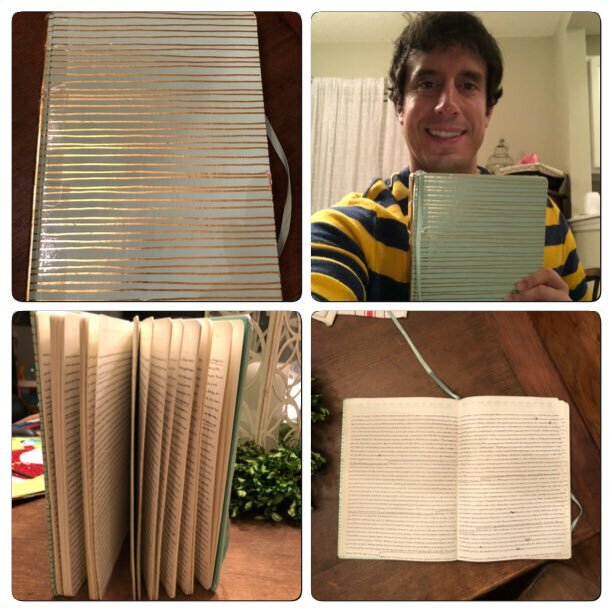 Each journal I use lasts me about 1.5 – 2 years and comes to represent a stage in my life. The one I am just a couple pages away from finishing is special. It contains our wedding day, our honeymoon, the day Sid told me she was pregnant, the birth of Sloan, the baptism of Sloan, and so much more. I purchased it on June 3, 2016, from Books-A-Million and it has served me very well. I am just about finished with my latest journal. This particular one contains many special memories. Looking For a Haircut? – I was once notorious for only going to Great Clips for my haircuts. I wised up before my wedding and went to an actual salon. Since that time, I have continued to see the same stylist at the same salon. This afternoon I went in for my pre-Christmas cut and once again wasn’t disappointed. 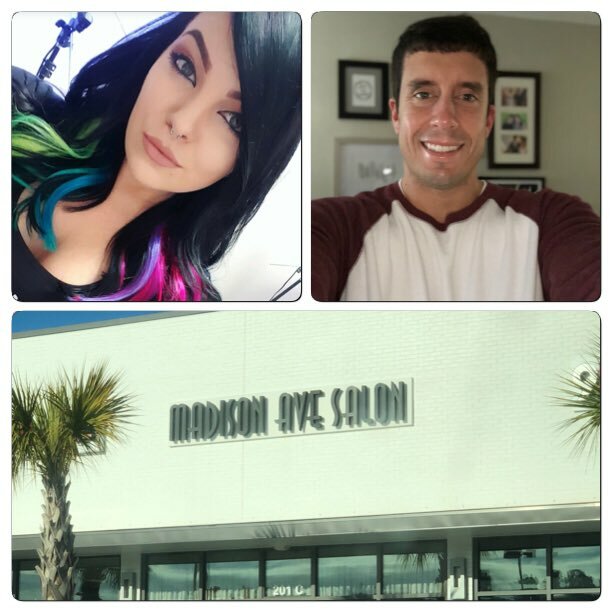 Guys and ladies, if you want consistency and confidence, go see Hailey Watkins at Madison Avenue Salon located at 201 International Drive. You can follow her on Instagram or Facebook. I recommend visiting Hailey at Madison Avenue Salon. Compare my hair in this photo to my hair in the photo about my journal to see why! 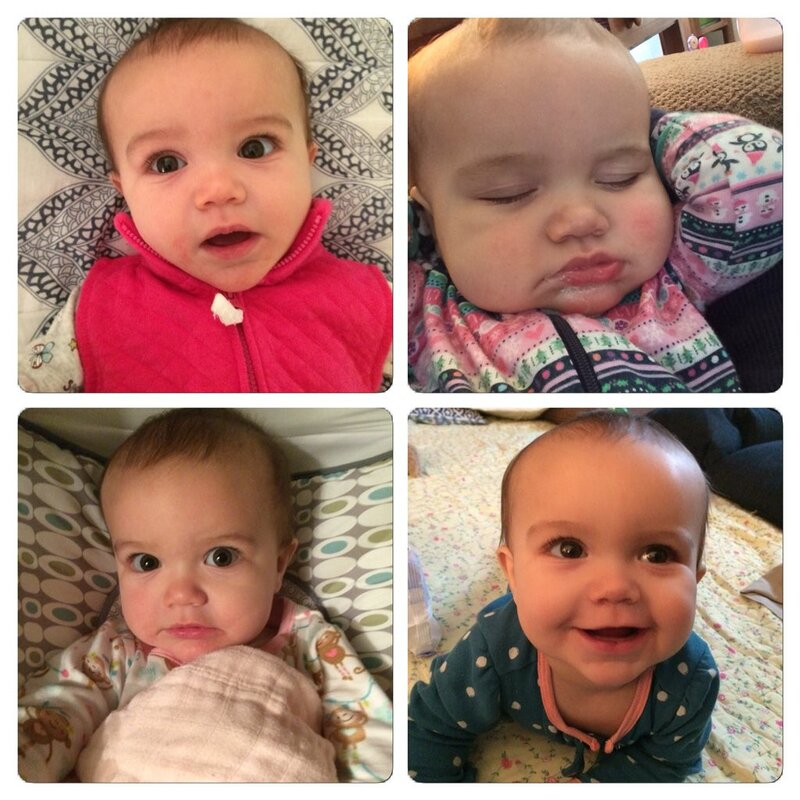 Sloan at 40 Weeks – Our daughter has been all smiles this week. Would you believe that growling at her makes her laugh hysterically? Even crazier, would you believe that scaring her (yes, scaring her) makes her chuckle even harder? Both are true. Telling Sloan “boo” or surprising her by popping out from underneath her jumper toy will make her giggle. As my mother-in-law would say, she is “a mess.” Sloan has a huge week ahead as she will celebrate her first Christmas, fly cross country again, and see snow for the first time. This is Sloan’s photo collage at 40 weeks. Until Next Year, #CCU – At 1:15 p.m. today, our campus closed down for the holidays. Every year I try to express how grateful I am to Coastal Carolina University for being so generous when it comes to Christmas break. Staff members receive just shy of two weeks off in late December to be with their families and celebrate the season. It is the ultimate present from my employer and a major perk of working at CCU. I don’t report back to the office until Jan. 2, 2018. I would like to wish everyone a wonderful Christmas weekend. Enjoy your family and friends while thanking God for giving us the ultimate gift. Don’t Blink. In college, I was playing on an intramural softball team. We made it to the semifinal round of the end of season tournament and found ourselves in a close game. One of our best hitters, a former high school baseball player and member of the university club baseball team, was up to bat. The pitch was delivered and the sweet spot of his bat made perfect contact with the ball, sending a screaming line drive right up the middle. The pitcher didn’t stand a chance. The ball pelted the part of his face where the forehead and bridge of the nose meet. For someone who doesn’t do well with blood, it actually wasn’t the sight of the red misty cloud that sifted through the air on impact nor the horrific bloody aftermath that stained his face that haunts me the most. Rather, it was that sound of crushing bone that sticks with me. It was a truly brutal scene. I couldn’t look as the poor guy cried out, his nose shattered and his face fully covered in blood. I looked away and called 911. As we waited for the paramedics to arrive, the girls on both teams were crying. Intramural officials did their best to tend to the player while many of us stared in shock with hands on our heads. After the ambulance took the pitcher away, it was decided by both teams that we would finish the game. My team ended up winning and, without being able to visit with our opponents and get word on their teammate, we had to run to another field and play in the championship game. We won the title and somehow managed to smile for the obligatory photo, but we were all very shaken up. 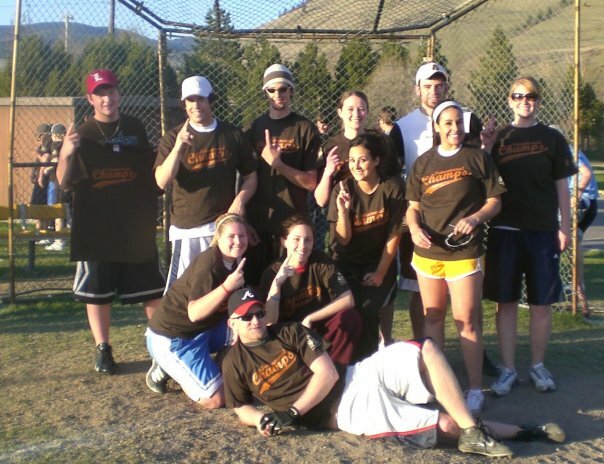 Sporting our championship t-shirts, this was my softball team (can you spot me?) that experienced a very disturbing episode during the title game. Today, I read an article about a Florida man who died this past weekend from a vicious injury on the softball field. He was pitching and a line drive hit him in the temple. He leaves behind a wife who he was married to for just a month. The couple had recently returned from their honeymoon. The International Slow Pitch Softball League is now making it a requirement that pitchers wear a mask while on the mound. Those players staunchly against it can sign a waiver and pitch without one. The rule has divided the softball community, with the folks against the new safety measure claiming that it is a kneejerk reaction to something that doesn’t happen often. Detractors also claim that pitchers should be able to field their position and protect themselves. I know for a fact that I wouldn’t take the pitcher’s mound in a slow pitch softball game. Even before the awful incident almost 10 years ago, I felt like a sitting duck on the mound. The distance between the pitcher and batter is just not safe. Even more concerning, many of these slow pitch softball players participating in these leagues are ex-baseball players with loads of experience and violent swings. A line drive up the middle is going to do serious damage. Coming from me, I support the new rule 100%. Slow pitch softball is an extremely popular sport that is beloved by many. However, it can turn to complete savagery with the swing of a bat. By the way, the pitcher who was hurt in that intramural game suffered broken bones but pulled through. I have no idea if he has any lasting effects from the injury today. Call me crazy, but I support safety measures. Don’t Blink. Way back in June, in one of my more favorite blog posts of 2017, I listed reasons why I am proud of Sloan. Over the past six months, Sloan has given Sidney and I many more reasons to be proud of her, with one of them being her ability to teach us about life. In tonight’s blog post, I want to list five quick reasons (in no particular order) in which Sloan has taught us lessons over the course of her short life. 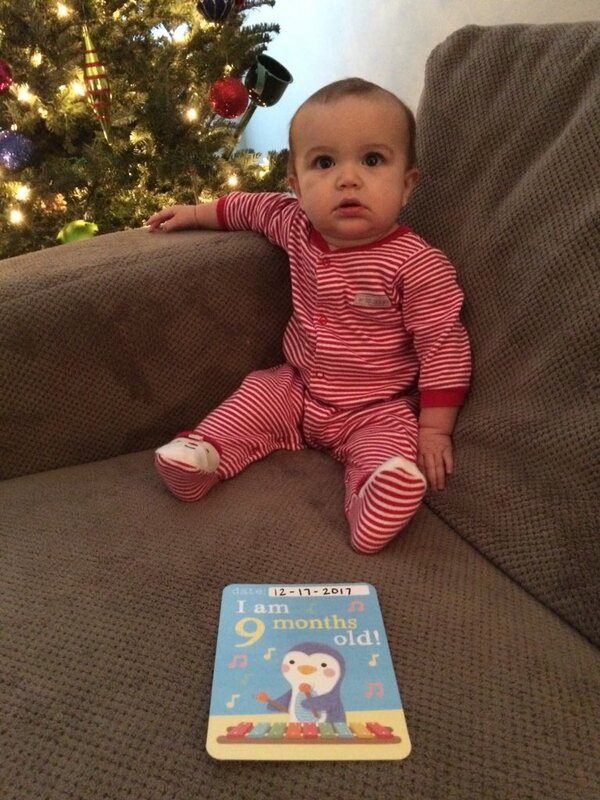 Sloan turned 9 months this past weekend. In the short amount of time, she has already taught me a lot. Lesson #1: Life is Fragile – Although Sloan is growing bigger and is much more robust than she once was, she is still very much a baby. When I hold her, I marvel at her little hands, her little feet, and her little ears. She doesn’t even weigh 20 pounds and we have to express her height in inches. I have to be very careful when I set her down or pick her up because her mini body simply requires great care. I work all day with people who have reached adult size so it is always an adjustment when I pick up Sloan at the end of the day. However, while she might be delicate, she still shares a trait with every other living human: she has a heartbeat. It just so happens that her little heart is inside a little body that requires the utmost care. Lesson #2: Genetics Are Real! – Oh what fun it is to observe the traits of Sloan. As she grows older each day, our daughter’s genes seem to become more pronounced. We can trace physical and behavioral traits to either her mommy’s side or her daddy’s side and there is never a shortage of examples. We get even more of a kick when friends, family, and random observers tell us who they see in Sloan. Yes, nature is pretty amazing. Our little girl is certainly a product of the two of us and it is a thrill to see it expressed. Lesson #3: Unpredictability – Having Sloan has taught us to become better at dealing with the element of surprise. When you have a baby, you have no idea if any given week, or just any given day, is going to go according to plan. Little ones become sick, keep random sleeping hours, have bathroom emergencies at inopportune times, and experience the occasional meltdown. All these episodes can throw a wrench into plans and schedules. However, because of good teamwork and patience by mom and dad, we have learned to roll with the punches when Sloan goes off script. Lesson #4: The Biggest Adjustment – Everyone will tell you that having a baby will change your life completely. This is absolutely true. It becomes very apparent that the freedom and the time you once enjoyed were things of the past. However, Sidney and I did a good job heeding this advice and anticipating lifestyle changes before giving birth to Sloan, thus making it feel as if the rug wasn’t completely pulled from underneath us when March 17 came along. But, you can only prepare so much. Sacrifices must be made and past expectations dramatically altered. Having children is the biggest adjustment anyone will ever have to face but it is so worth it. Lesson #5: The Power of Love – Until you have a baby, you will never realize how strong parental love can be. Having a child immediately makes your heart grow a couple sizes so that you are able to give your son or daughter the love he/she needs. It will make you question how you were even able to live before your baby was born. Your soul will never be the same and you will literally know what it means to “have a place in your heart” for someone. Aside from some of the big themes above, Sloan continues to teach me new things each day. I look forward to the evolution of my education via my daughter as the weeks, months, and years go by. Don’t Blink. Even though the holiday weekend isn’t until next week, this weekend that is now just wrapping up still had a special holiday feel to it. Tis the season for Christmas magic! In an attempt to hold myself back from spending all my energy looking forward to this upcoming short week, I wanted to briefly look back at the weekend that was. On Friday night, I spent the evening working. It was fall commencement at Coastal Carolina University so I was covering the two ceremonies held by our campus. It was a thrill for me as I had the opportunity to watch Eddie and Monica graduate. As my old interns were walking across the stage, I had the pleasure of grooming one of my new ones. Katie, a CCU freshman, made her #CCUSocialMedia debut and did a fine job. 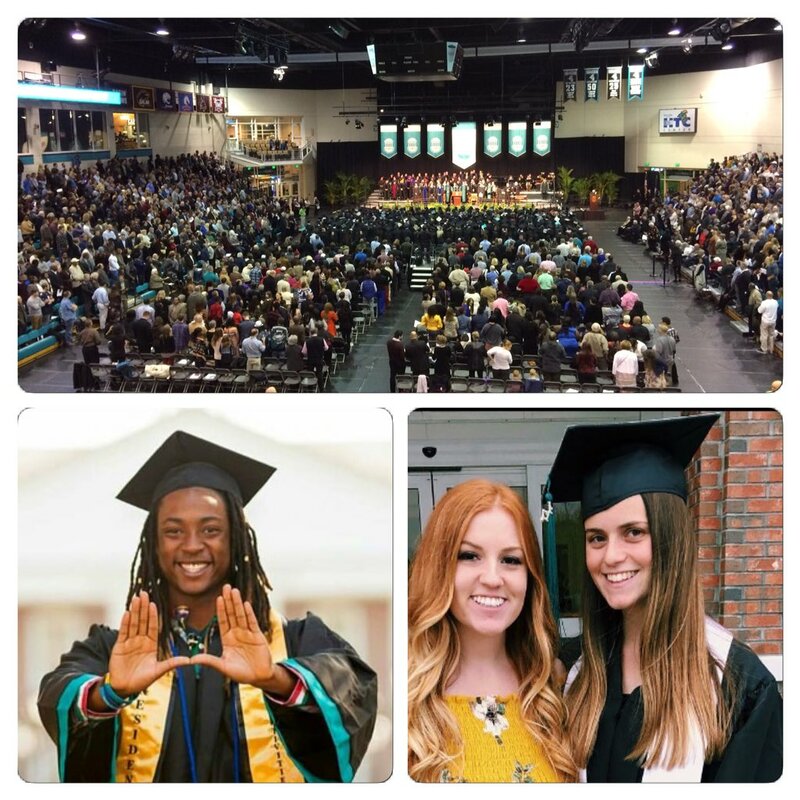 On Friday night I worked commencement at Coastal Carolina University and got to watch Eddie and Monica graduate (Photo creds: Image above taken by me, Eddie photo taken by Dennis Davis, Monica photo is from her sister). After a long week at work I arrived home late Friday evening ready to see my wife and daughter. We watched “Christmas Vacation” while enjoying the aroma of our Christmas tree, which seems to be smelling better and better each day. Sloan awakened bright and early on Saturday morning. We played those early hours away while Sid ran errands. I also had the chance to finish sending out our Christmas cards. We then embarked on the main event of the day: the Christmas celebration for Sid’s extended family on her dad’s side. We headed over to my sister-in-law’s house for the family event. Around 24 of us (counting three babies) gathered for some holiday cheer. We ordered takeout from Olive Garden and feasted on different pastas, salad, breadsticks, and those really good chocolate mints. The time then came for our Chinese gift exchange. The madness went for 21 rounds as I came out with a brand new wall charger and car charger while Sidney drew the coveted last number and selected an LED cinema light box. We concluded the evening with dessert, enjoying cheese cake and brownies. 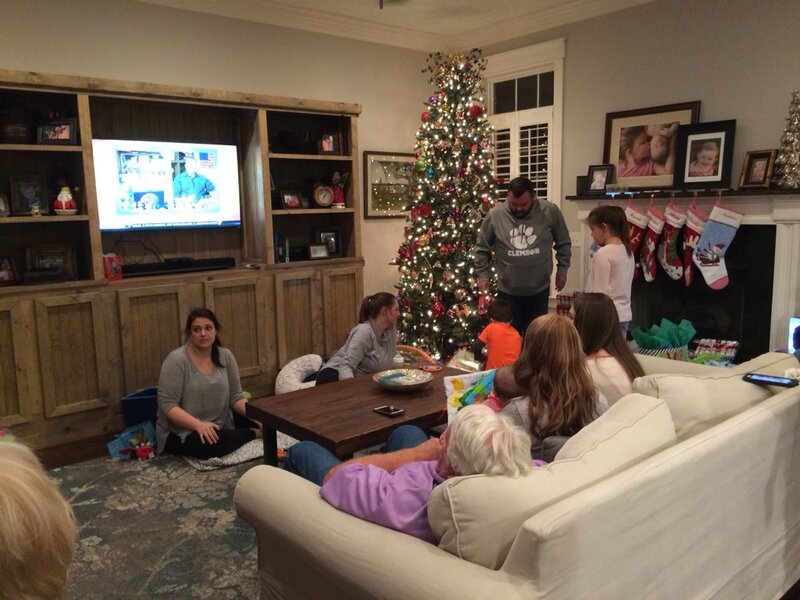 A look inside the Christmas celebration we had with Sidney’s extended family last night. This morning, we headed over to Sidney’s parents’ house to meet family members who came in from Jacksonville. Sid’s aunt, uncle, and nephew from her mom’s side were all in town to visit. We visited at the house and then we went out to lunch at Carolina Roadhouse. I enjoyed the only thing I have ever ordered there, the KILLER DOG. As usual it was delicious; and, as usual, I ate about a quarter of it. 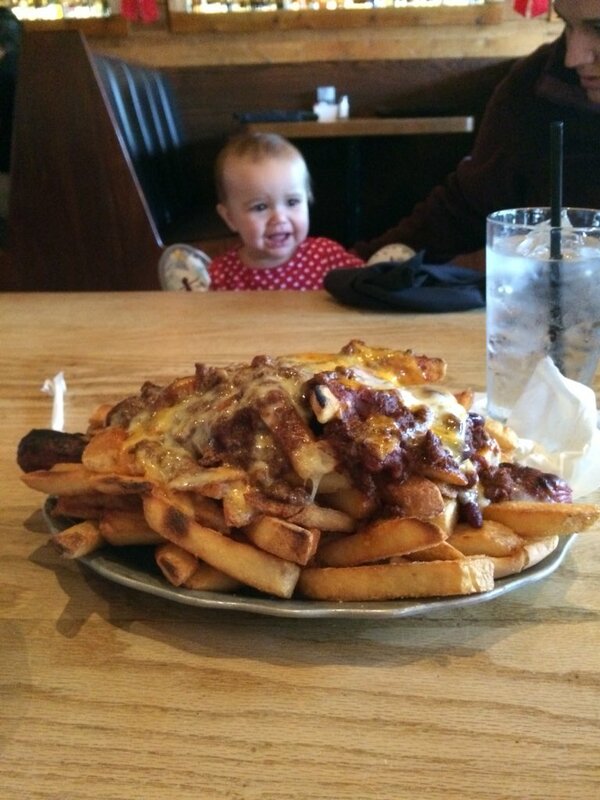 Sloan looks on this afternoon as I prepare to dig into the Killer Dog at Carolina Roadhouse. We came back to our home and rested for a bit and then we went to St. Andrew for 5 p.m. mass. We celebrated the 3rd Sunday of Advent this evening and Fr. Morgan delivered a great homily reminding us that even though Advent is a time for meditation, it is also a time for rejoicing. We don’t usually go to the 5 p.m. Sunday mass but the singing was beautiful and Sloan was a perfect little girl. As we conclude a nice weekend, the three of us are back home watching “A Christmas Story Live” and eating Christmas candy. Now we find ourselves back home in front of the TV watching A Christmas Story Live and eating holiday treats. What a weekend! Life is good and it is only going to get better this upcoming week. Don’t Blink. This afternoon at around 3:30 p.m., our social media team at Coastal Carolina University will decrease by 66%. At that time, President DeCenzo will be telling the students gathered in the HTC Center to move their tassels from the right to the left. When Eddie Harris and Monica Trepiccione follow the President’s instructions, they will effectively conclude their time with #CCUSocialMedia. I am a little sad about that. Although I am lucky to work with incredible content creators within our University Communication department at CCU, I only have two people working directly in the social media program with me. Eddie has served as my intern for two years and Monica for one. They have both contributed to our social media program immensely and their services will be sorely missed (click here to watch the tribute video we made for Monica and Eddie). I am going to miss these two! When I speak to classes, I always tell them my job is awesome. I brag that I have the privilege of interacting with thousands of people via their computer or smart device each day and that I get to represent a first class university in a very public/visible manner. However, I then add that while both of those job duties are cool, nothing is better than the opportunity I have to work with students. Working with Eddie and Monica has reinforced this incredible perk even more. This is Eddie and I at a senior recognition event in April. I don’t know where our social media program would be if not for Eddie and Monica; surely not one of the best in the country. 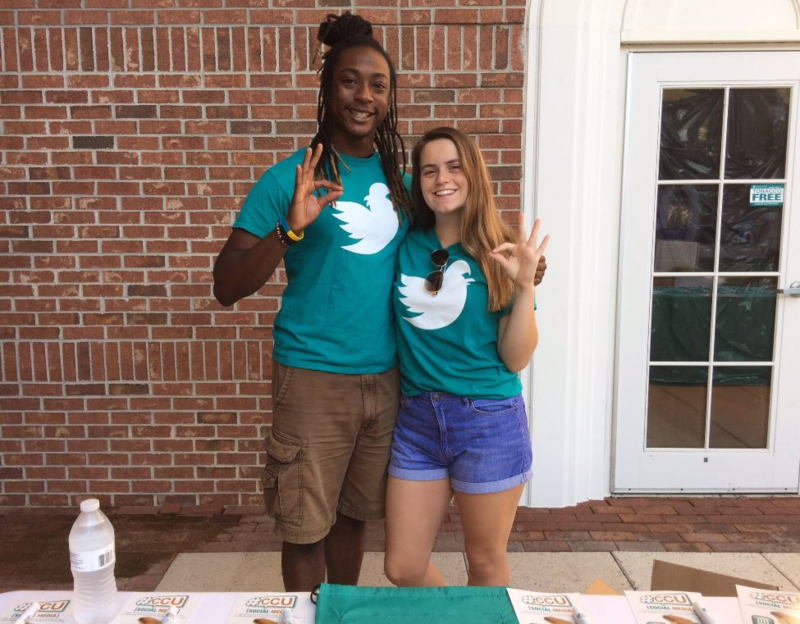 Both of these young people brought creativity and perspective to the office each day and helped keep CCU current and fresh in the higher education social media world. 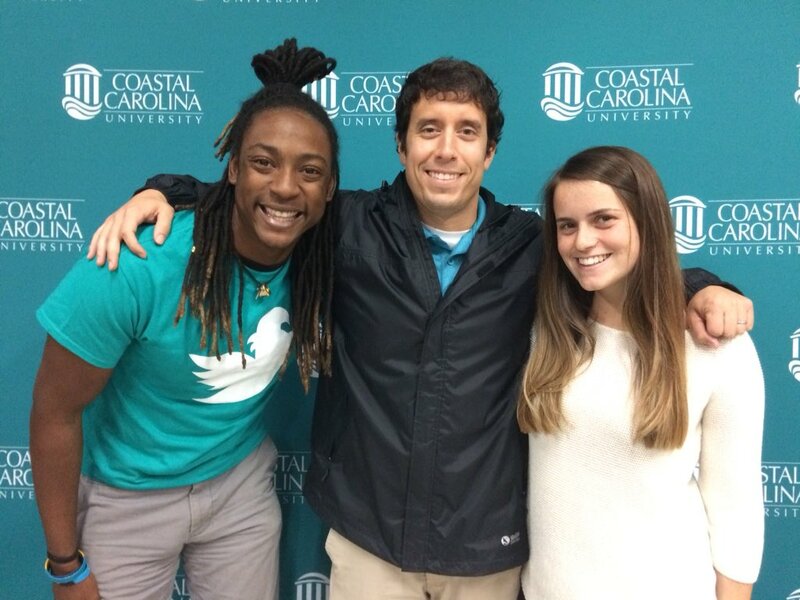 Monica and I (and Ethan) at a #CCUSocialMedia event in October. Don’t think they hung out and tinkered around on Facebook for the duration of their internships. They did the dirty, grassroots work needed to keep a social media program afloat. I had them running around campus each day, recruiting students for campaigns, covering events where they stuck out like a sore thumb, stringing together lengthy Snapchat stories, perfecting content for me to post on our major channels, and much more. They worked non-business hours, they covered events that I couldn’t attend, and they even worked from home. I wish both Eddie and Monica the best of luck. But besides just excelling at their jobs, both were genuine and compassionate people. They asked me about Sloan, inquired about Sidney, patiently explained trends, joked around, and always asked what they could do to further assist. What more could I ask for? 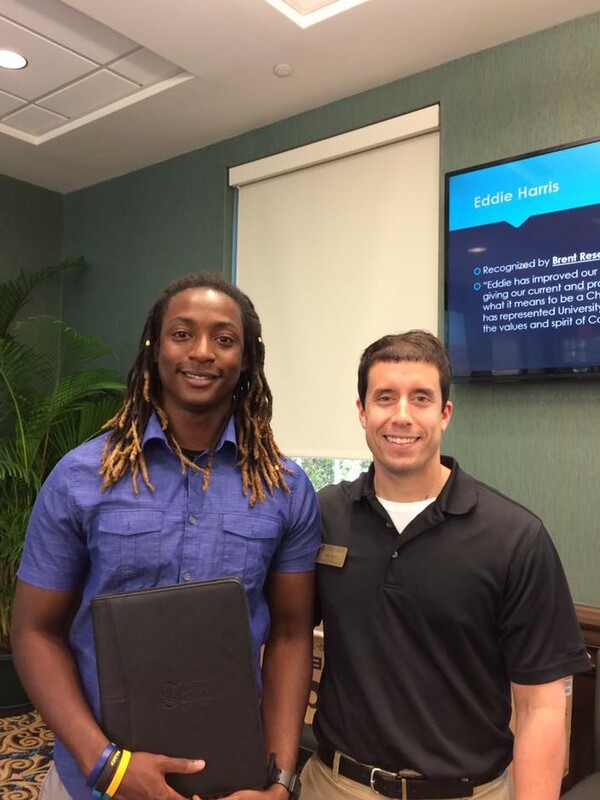 Eddie and Monica didn’t just have an impact on #CCUSocialMedia, they had an impact on me. I can’t wait to watch them graduate today and then keep tabs on them as they find plenty of success in the future. I am extremely appreciative for all they have done and I will always remember them fondly. Don’t Blink. The Best White Elephant Gift – I recently mentioned that scratch offs are the best option to bring to a Chinese gift exchange. However, we won an even better gift at Sidney’s work party. On Saturday night, we left the function with a case of books for Sloan. 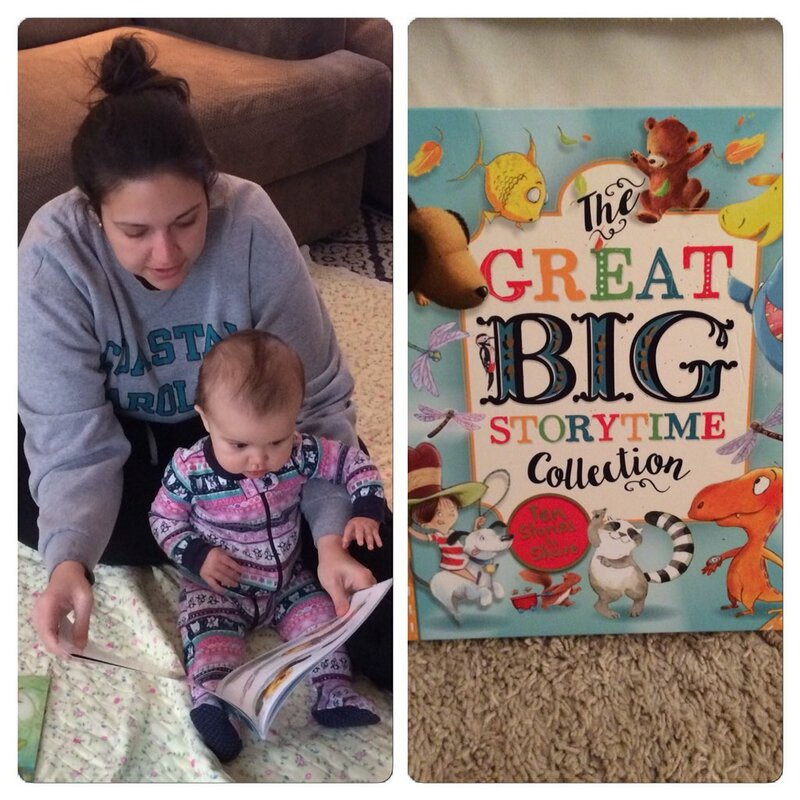 Called the The Great Big Storytime Collection, it contains 10 stories. As someone who wants as many books for our daughter as possible, this present is going to be very tough to beat. We have already started reading these stories to Sloan and she will patiently sit through one before she starts grabbing at the pages. The Great Big Storytime comes in a case that opens up into 10 individual stories. This photo shows Sid reading one of them to Sloan. Planning Babies Around Christmas – In Dear Abby this morning, readers responded to a past letter from someone who suggested parents should plan having their babies around the Christmas season. Doing so, according to the letter, will eliminate the awkward case of a child having both his birthday and Christmas celebrated so close together. Excuse me? Does anyone out there actually think that way? Of course readers responded by saying a December birthday is a blessing and offering up ways that both events can be celebrated in a creative and equal way. These rebuttal letters were great but I couldn’t get past the notion that someone would ever suggest such an obscure “planning” idea in the first place. Too Much – Every now and then I like to feature an absurd dish/snack from my favorite food account on Twitter. Tonight you are looking at a doughnut ice cream sandwich. In my humble opinion, I think the textures and flavors are mismatched. I don’t think a Krispy Kreme glazed doughnut gels well with ice cream. Take a minute and visualize chomping down on a doughnut with ice cream in the middle. Weird, right? If you forced me to eat that combination, however, I would rather have a scoop of vanilla ice cream as opposed to chocolate. At least the vanilla would streamline the flavor of the odd combination to some degree. I just don’t think this was well thought out. 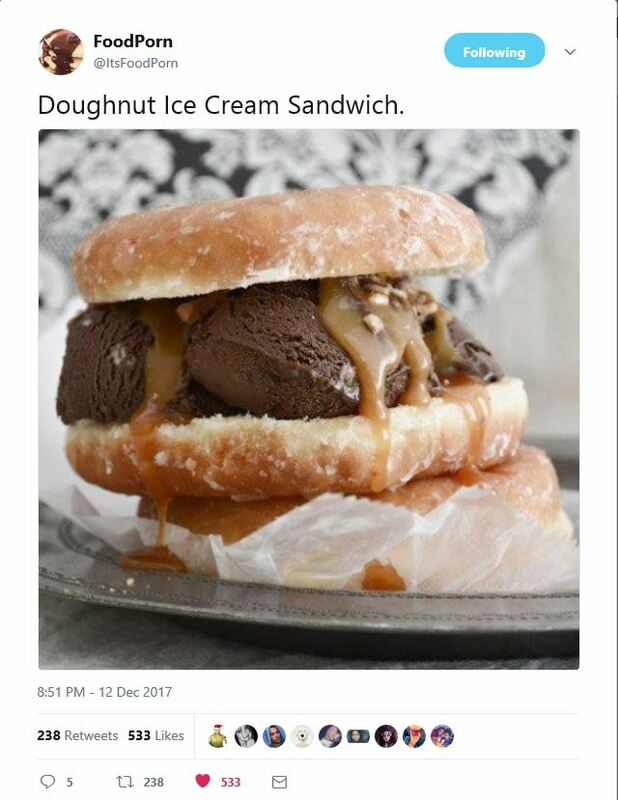 In my opinion, the Doughnut Sandwich has identity issues. Christmas Specials – Tis the season for Christmas programming. This year, we are watching more of the one night specials as opposed to the countless Hallmark movies. Sid says that with no crazy pregnancy hormones this year, she just isn’t craving the heartwarming yet predictable (and corny) made-for-TV films. So, a couple nights ago we addressed Christmas cards and wrapped presents will watching the Gwen Stefani Christmas Special. The evening before that, we watched the “Great Christmas Light Fight.” Before that, we watched A Very Pentatonix Christmas Special. All of these shows have helped heighten our holiday spirit. By the way, how does Gwen Stefani continue to look so good? Sloan at 39 Weeks – Tomorrow, Sloan will turn 39 weeks. Then, on Sunday, she will turn 9 months. After battling sickness last week, Sloan has enjoyed several days of health and happiness. She is still “army crawling” and rolling to get around. Last night I gave her just a tiny taste (well, maybe three tiny tastes) of my hot chocolate and she absolutely loved it. She smacked her lips for several minutes afterwards. She is pretty independent and will sometimes rip the bottle out of our hands and feed herself. She is counting down the days until Christmas morning. 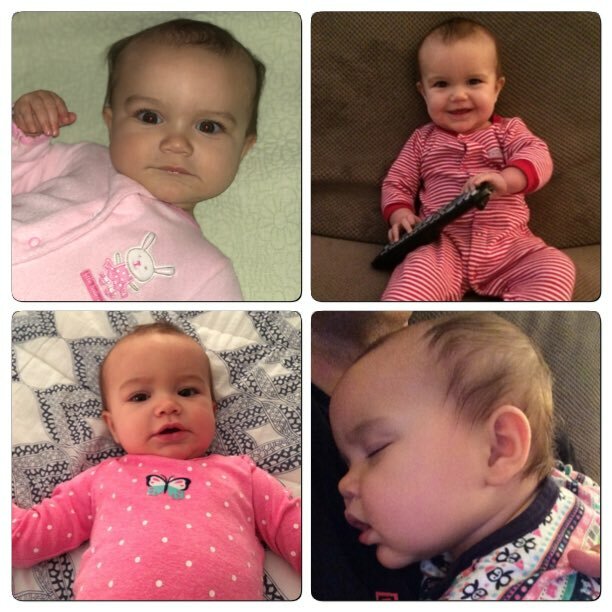 This is Sloan’s 38 week photo collage. Like I said, we have a holiday party to get to! Have a wonderful weekend and don’t miss out on those Christmas specials. Don’t Blink. A true test of talent can be found in versatility. Sure, we are all good at certain techniques and areas within our respective jobs. However, are we gifted enough to produce positive results when we decide to switch gears? I pose this question to celebrate the success of the 2017 #CCU Holiday Video. Today at noon, we released our latest annual installment of digital cheer. This year’s holiday video came after a string of successful predecessors, culminating in our 2016 hit that took our campus by storm and smashed view records. 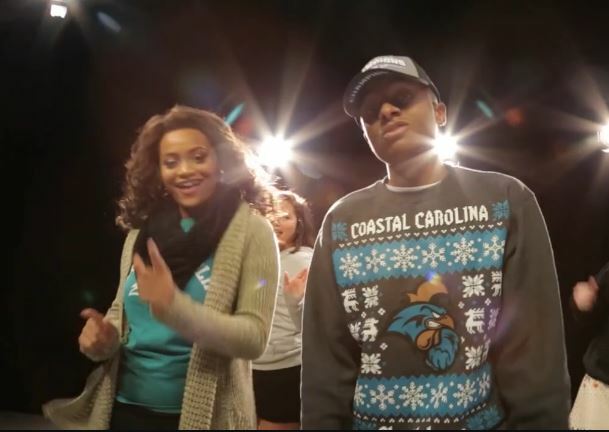 The 2016 #CCU Holiday Video was a massive hit and left a lot to live up to this year. The task to follow up last year’s viral sensation fell on the shoulders of the duo who created the monster in the first place. Our senior marketing director, Lindsi Glass, and our production manager, Geoff Insch, teamed up again to produce the 2017 version. What would these two content creator geniuses come up with this time? Having built a successful reputation for creating catchy and creative videos that go outside the norm and push the envelope, did they have another idea up their sleeves that would once again include an original song, a well-known pop culture theme, and over 200 extras? Instead of piggy-backing off of 2016, they pulled a 180. Rather than go for the funny bone, they went for the heart. To say the least, it worked. The video centers on Lilly, a natural star. During the voiceover, our beautiful campus is showcased and some of the people who make it such a great place are featured. 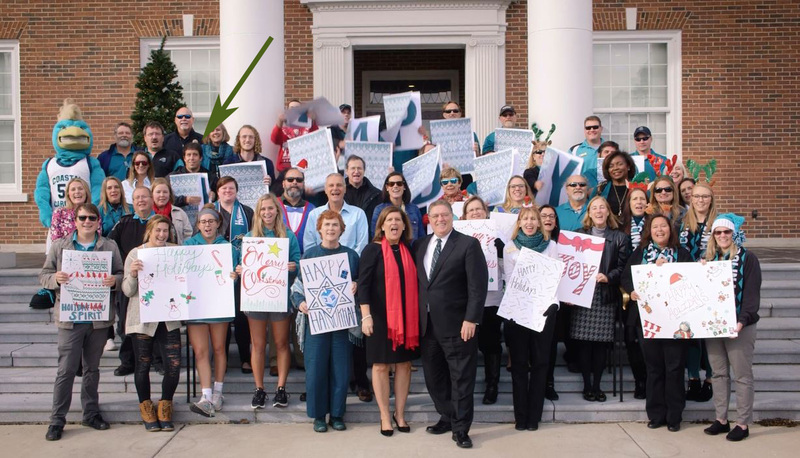 But between the beauty shots of #TEALnation and the images of President DeCenzo and Mrs. DeCenzo gushing over the note, there is a heartwarming dynamic that plays out between Lilly and the person who sticks close to her side throughout the video. 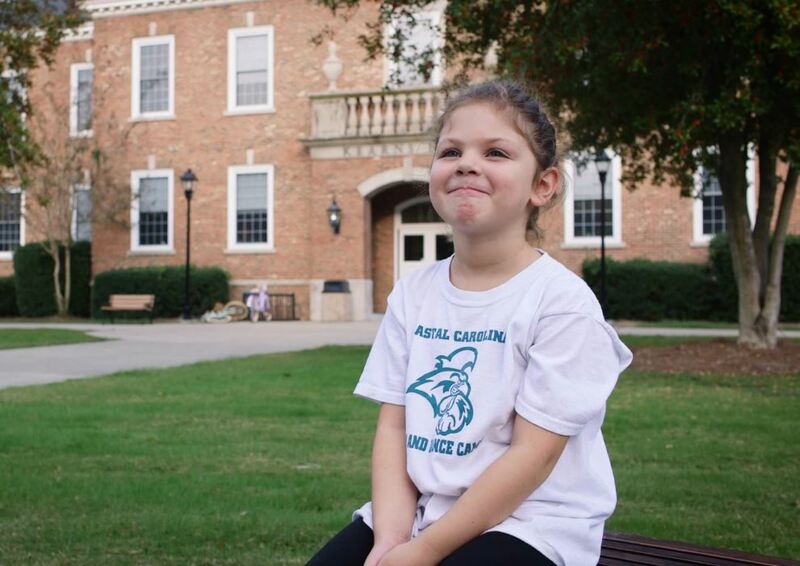 Caroline Smith is our university editor and Lilly’s mom. She was nice enough to stand in for a crucial supporting role in the production. The mother-daughter relationship is hinted at throughout the entire video but it isn’t fully revealed until the very end. When the connection is finally disclosed, it is done in the sweetest way; a way in which has made our #CCU community tear up all day long, a way in which makes it mandatory that you watch it, a way in which will truly make you appreciate what Lindsi and Geoff accomplished. Lilly and Caroline work together to provide a classic and touching performance. It was no simple task following up last year’s video, especially with a completely different concept. 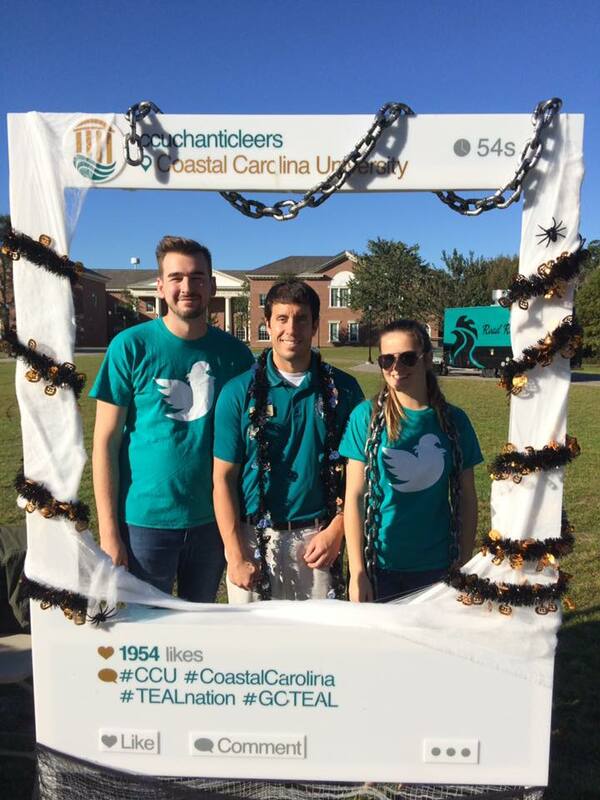 But our University Communication staff pulled it off and once again made our entire CCU community proud. To Lindsi, Geoff, Caroline and, last but not least, Lilly – great work! Don’t Blink.